Android owners often pride themselves in having the latest and greatest in terms of both phones and apps. Ever since the creation of the Andy Assistant for Android (which predated the ever popular Siri iOS assistant), both developers and users alike have sought to find the best AI helper, with plenty of hits, misses and updates along the way. 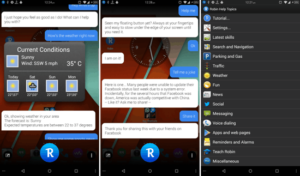 Here, we take a look at the top ten best personal assistant apps for Android. Starting off our list of best personal assistant apps is Robin, which despite being on the market nearly as long as Andy, has remained in Beta. Despite the lack of developer confidence, Robin is one of the first and best competitors to Siri. Features include the ability to send texts via voice command, call via voice, as well as a pretty accurate map and traffic system which includes gas price estimates throughout the route. While there are a few features missing here and there, the fact that it is very regularly updated and new features come with nearly every update makes that issue easy to overlook. Another veteran Assistant app, Skyvi was one of the first to adopt social media integration. Besides your normal messaging capabilities, both Facebook and Twitter can be accessed and modified through Skyvi in very short manner. The User Interface and user interactions are rather simple, so it won’t win any awards for higher functioning, but for those looking for a simple and light personal assistant app, Skyvi is a great choice. As an added bonus to those with an easy going sense of humor, one of the most touted features of Skyvi is the “Tell me a joke” option, which while sometimes cheesy, shows some developmental effort. 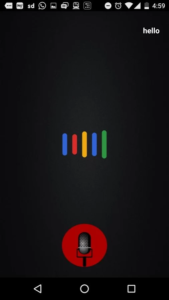 Assistant by Creative Indian Labs is the first on this list to compete directly with Siri and Google Now in terms of aesthetic and functionality. While it can at times miss the mark with voice and command recognition (especially if an accent is carried), in most cases it doesn’t have issues. The User Interface is about as simple as it comes, and could benefit more from text entry capabilities or a menu, but for what it is, Assistant by Creative Indian Labs does its job well. Let’s face it. If you’ve ever watched any of Marvel’s latest releases and you’re reading this list, your dream would be to have your own Jarvis. While ItsMyLab didn’t quite make that dream a reality, they at least gave it a good shot. The first on this list to offer Android Wear capabilities, Jarvis can appear on both your Android Watch and Phone, and can manage tasks on both devices with ease. 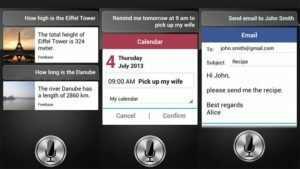 With your normal abilities to set alarms, change phone settings, and piggyback off other programs to perform tasks, Jarvis also carried a feature called “CloudVoice”. While not true AI learning, this feature allows Jarvis to have dynamic conversation responses, and if there is error in the response it can adjust and “learn” from said incidents. Another app to claim to be in Beta (though given the fact it was last updated over a year ago, such a claim is doubtful) Indigo is a personal assistant with plenty to offer. Under its deceptively simple user interface is a connectivity to nearly every other app on your phone, social media accounts, and of course Google. This allows for you to schedule a meeting and check the weather while listening to your favorite music without so much as lifting a finger. Indigo also offers translation services for international travel, and while not always accurate, typically the message will get the desired point across. AIVC (called Alice for sake of ease) by YourApp24 is one of the smarter personal assistants available for both free and a few bucks for the pro version. 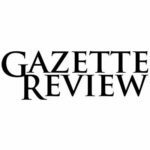 While most of the features are relegated to the pro version, both offer plenty of functionality in terms of scheduling, searching and blending features of other apps. The voice response can at times be quirky (there has been more than one report of Alice giving a snarky response to a question) but honestly that can be seen as a plus in an otherwise two-dimensional personality field. 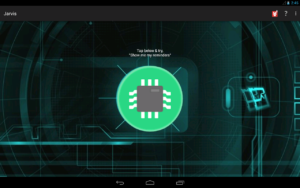 The ability to program your own voice commands is also a very near feature. 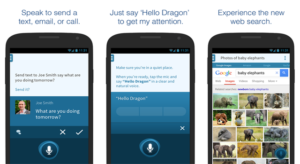 Centered around voice commands, Hound is pretty easy to get the hang of. With a design that focuses around speed of response, Hound is pretty good at getting the answers you want, fast. Hound is one of the few personal assistant apps to partner with Uber to allow for in-app fare estimates, as well as allowing for Expedia booking if air travel is needed in the near future. In terms of entertainment, Hound also carries some Shazam like features, allowing you to hum a song or have it listen to the radio to detect what song is playing. From Nuance Communications, Inc. Dragon Mobile is one of the best personal assistants in terms of personalization and response. While many personal assistants allow for only one voice, Dragon can be edited to have a wide variety, and also can be programmed to turn on from the use of a specific word, responding only to your voice. With the other standard features you would expect from up to date assistant apps and a UI that makes adjusting settings a breeze, it is a well made app for anyone on the go. 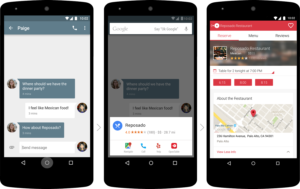 Coming standard with every Android phone, Google Now is more an extension to a suite of programs than just an assistant app itself. Often referenced as a search tool, Google Now can also adjust everything you need to on google accounts such as calendars, contacts, and music, while finding answers for any query. While some may not love the idea of transferring all of their data into google accessible formats to make the full use of Google Now possible, for those who don’t mind it’s an incredibly easy and useful app. Coming in as the number one personal assistant app for Android is Cortana, by Microsoft. 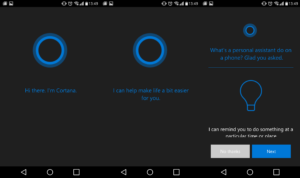 Named after the famed AI companion in the popular Halo series, Cortana can link between computer and smartphone and make life easier on college students, professionals, or anyone who wants to keep their life in order. While working best in conjunction with an active PC account (especially if you have Windows 10), even as a standalone, Cortana offers plenty of benefits for the amount of space it takes up to download. One of the best features is curation of articles that can be of benefit to the user in a professional sense (latest medical research for physicians, stock predictions, etc) that can easily be accessed on either computer or phone. The overall user interface takes just a few moments to get used to, and is afterwards quite natural. 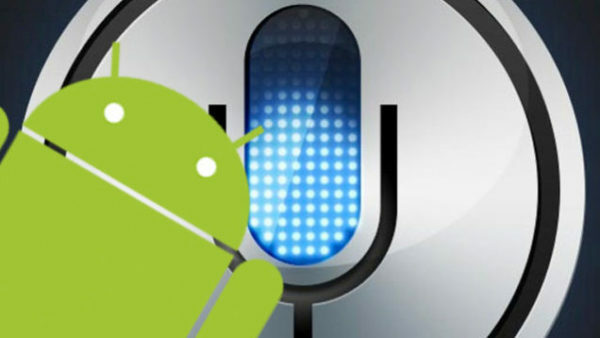 This wraps up our top ten list of personal assistants on android. While I’ve tested each of these apps, Cortana had to be my favorite due to the PC to phone link up as well as the delivery of research materials relevant to my fields of interest. Did we miss any of your favorite personal assistant apps? If so, be sure to leave a comment on what is your favorite and why.